The tactical plan was for the tanks to stand in close and subdue enemy weapons in a bunker to give the infantry the chance to rush the last few yards and deal with the Japanese. Particularly dangerous was the tendency to use the tanks where the ground was unsuitable; even worse were the spots where the existence of swamp and bog forced tanks into a narrow front where they could not manoeuvre. But the Japanese soldier was no fool. They had shown earlier that with well concealed anti-tank guns they were capable of destroying several tanks without their location being found. The first tanks went into action on 18th December 1942 but in the following 3 weeks all were lost. Eleven fresh tanks were called up and 7 of these were rushed into action without proper preparation and these were also lost. The last part of the Buna battle began on 10th January 1943 when the 7th Australian Division had the task of clearing the Japanese from their positions astride the junction of the tracks around Salananda and Cape Killerton. It was decided to use 2 battalions of infantry ( 2/9th and 2/12th) assisted by 3 tanks from 2/6th with a fourth tank held in reserve . These 4 light tanks were the only ones that had been able to overcome the jungle swamps and to get through from the coast. The enemy defences were formidable and had resisted all attempts to remove them. Artillery support was confined to only a few guns that were extremely short of ammunition. The tactics were to use the tanks to subdue the fire of the enemy strong points in order for the infantry to get close enough to go in and clean them out. Infantry reconnaissance had not disclosed any enemy anti tank guns although an anti aircraft gun had been located but was thought to be out of ammunition. On the evening prior to the attack, the Tank commanders made a close reconnaissance on foot of the enemy positions astride the road and in particular, of the area surrounding the anti aircraft gun position. The tanks faced an old problem. They were to force a way for the infantry into the enemy position but the only access was along the 15 feet wide roadway which was bordered by deep swamp and jungle. Even the verges were too soft to hold the light tanks. The Tank Group Commander considered these conditions were highly unsuitable for his tanks and not only protested to Brigadier Wootten about the task they had been given but also took the unprecedented step of requesting the orders be put in writing but he did not press this after closer infantry co-operation was promised, although, in reality, never feasible. At one minute past eight on 12th January in the morning mist and through the swampy bush the tanks began to cross the start line. Warren was in the third of these three tanks. The official War Memorial account describes 12th January 1943 as a day that went wrong from the beginning. The tank crews had been told that there were no anti-tank guns to hinder them and that their task was to knock out the Japanese bunkers, but no one could tell them where those bunkers were. The road ahead was a narrow defile through the swamps, the ground flanking its raised surface so soft that no tank could travel on it, the track itself so narrow that there seemed to be no hope of any tank turning once it had crossed the line. Thus there seemed to be one way only for them- straight on. The first tank had gone just 60 yards when a shell struck the front of it, ricocheted on to the driver’s flap - which it sprung wide - and stunned the driver, whose head was pressed against the wall just above the aperture. They were hit by two more shells but then a fourth shell smashed through the vehicle and burst inside it. The only way they could now escape was to take the risk of getting off the track so they wirelessed the second tank about what they were doing and plunged into the bush on the left. The second tank then went ahead but in its turn was hammered badly by the enemy gun before it could get off a shot at its unseen enemy . It had received over 20 rounds of 37 mm fire before one penetrated the armour and wounded all the crew and killed it’s commander. It now seemed that, blinded and partly crippled and caught within the narrow confines of the track, the tank was doomed. But the driver was brave and cool. Despite a burnt face he peered through a gaping hole in the broken vehicle and performed a seemingly impossible feat of turning around on the track, and the tank limped out of the fight. Undaunted, the third tank with Warren in the crew moved up at once to continue the action. It was not engaged long however before flame exploded round the vehicle, probably in part at least from a mine pushed beneath it on the end of a forked stick, and the tank itself was seen to be on fire. It was gutted and the crew perished, but precisely how each died is still uncertain for the fog of battle then closed around them. 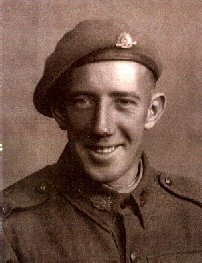 Warren was officially reported MISSING BELIEVED KILLED on 12th January 1942 and shortly after was reported KILLED IN ACTION. The Australian commanders were bitterly disappointed at the apparent failure of the day. Hardly any ground was gained, the infantry lost 4 officers and 95 men whilst the 2/6th lost all 3 tanks, 6 of their 15 crew were killed including 2 of the 3 tank commanders and Warren. All the remaining 9 crew were wounded. General Vasey took counsel with his officers in the evening after which he drew the correct conclusion from this unfortunate set back and reported to Headquarters New Guinea Force, that the ground was entirely unsuited to tanks and that further employment of armour to support infantry attacks would be useless. For the record it took another 10 days to clear the enemy from the area. Warren was buried near where he died close to Buna (army reference map 200232) but the date of burial is not recorded. 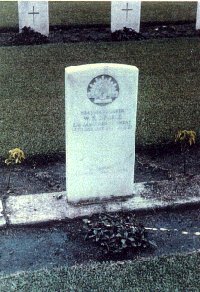 His body was reburied on 23 March 1943 in Grave 4, Row B, Plot D (Ref 20/3223).